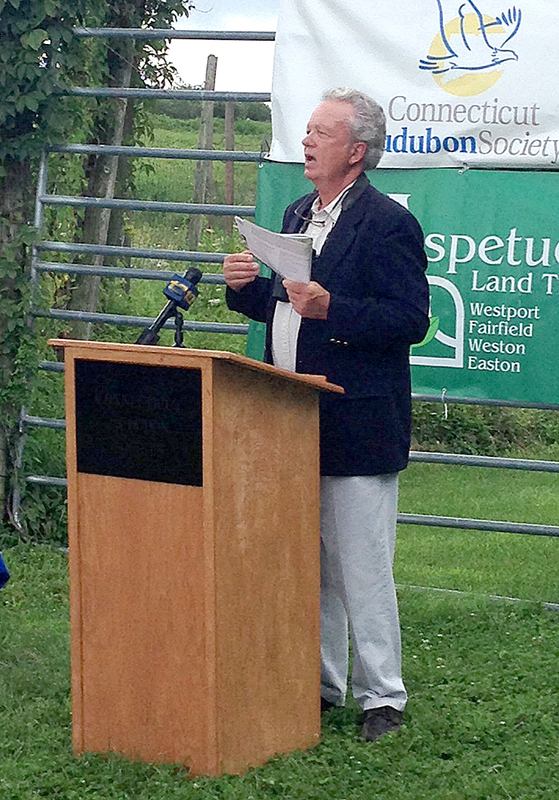 Milan Bull of Connecticut Audubon speaks during the press conference to introduce the 2014 Connecticut State of Birds report Monday at Trout Brook Valley conservation area in Easton. Habitat, its proper maintenance, and its importance to a variety of birds is the topic of the 2014 Connecticut State of the Birds Report released Monday by Connecticut Audubon Society at an event at Trout Brook Valley. As usual, the report — this year titled “Connecticut’s Diverse Landscape: Managing Our Habitats for Wildlife” — is full of valuable research and information about a topic regarding birds. Here’s my story at http://www.thehour.com, click here. This entry was posted in bird habitat, Birding news, landscaping for birds and tagged Connecticut Audubon Society, Milan Bull, State of the Birds Report by Chris Bosak. Bookmark the permalink.